Don't you just love those sweet, adorable, little Clementines? I have been eating 2-3 each day as a mid-afternoon snack, or sometimes after dinner (not exactly the equivalent of a post-dinner dessert, but definitely alot healthier). According to Produce Pete (everybody's favorite authority on fruits & veggies), the clementine is actually a mandarin orange, imported from Spain and Morocco. They are a cross between a sweet orange and a Chinese mandarin and they are only in season from October to February so we are almost at the end of prime clementine season. After awhile, eating them just out of the peel gets a little boring. And I thought it would be great to be able to use them in a more formalized dessert fashion. Well, apparently, I wasn't the first one to think about this (imagine that) because there are quite a few recipes out there for clementine desserts. But I wanted something easy and something with all the ingredients already at hand. I found a great recipe at Cooking Light and I want to pass it along so you can take advantage of the last few weeks of clementine availability. 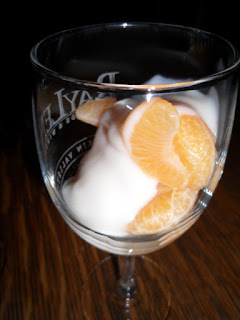 This is a terrific dessert that you can dress up by using martini glasses, or just use small, individual bowls (I used some vineyard wine glasses that were handy). And, because it's low in calories, it will come in especially handy tomorrow (after we've eaten all those Super Bowl snacks today!). Enjoy!